Not all five star hotels are created equal and when you are splashing out cash on a high end hotel stay, you want to make sure you are getting what you pay for. The beautiful Viceroy L’Ermitage in Beverly Hills, Los Angeles doesn’t disappoint. The hotel has a very refined classic feel – it isn’t at all showy or pretentious, just beautiful suites, high quality interiors and excellent, discreet service. We love the location too, while it won’t suit all travellers to LA who want to be in the thick of the Hollywood action, for those who enjoy the ‘almost too perfect to be real’ atmosphere of Beverly Hills the hotel is perfectly placed in a quiet residential street located only a short walk (or hotel town car trip!) away from the world famous Rodeo Drive. Being LA, the hotel is a favourite amongst the rich and famous and the staff are well versed in subtleness and discretion. The hotels features a gym and pool area with 360 degree views over the hills and city. We dined at the in-house restaurant Avec Nous, which serves up French bistro style food (try the papardelle pasta with egg and black kale – delicious!). What really stood out for us about the hotel was the size of the suite rooms – all of which feature balconies, marble bathrooms and dressing rooms. For the quietest rooms choose those away from the street side. The hotel is family friendly with child-minding services available and pets are also catered for (and lovingly pampered!). 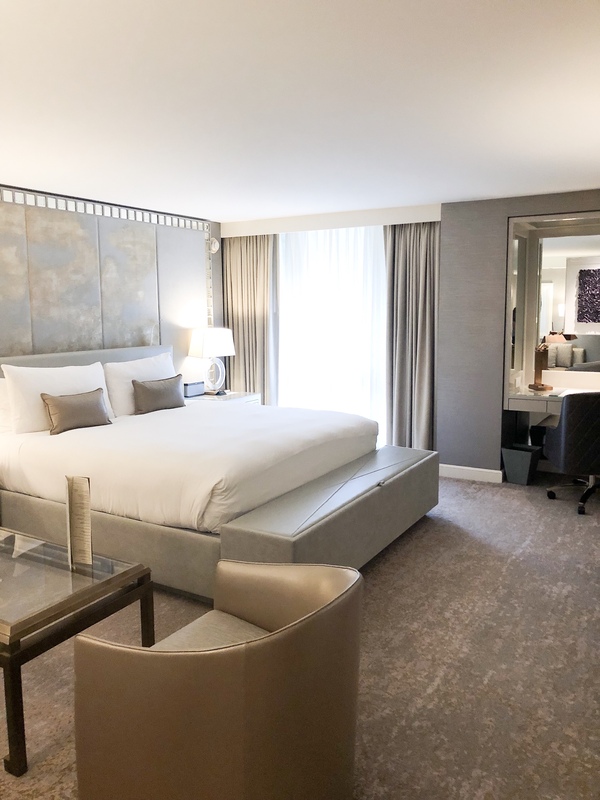 Like most hotels in Beverly Hills the Viceroy L’Ermitage isn’t cheap however for the superior service, quality, location and room size we think it’s worth every penny. For more information visit the hotel website here. Want more 5 Star hotels? Click here for one of our favourite Dubai hotels to escape the desert heat and here for a stunning hotel in the Australian city of Perth. ooohhhh that pool shot is so dreamy. looks like a scene out of a movie! It was too cool to swim when we where there but on a hot sunny day I bet it is magnificent!